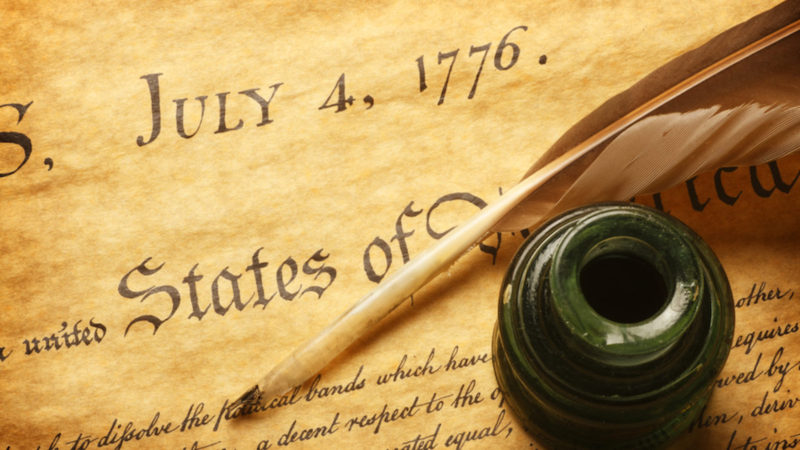 As youth, many of us were required to memorize – or at least study – the Declaration of Independence. Although we might not be able to quote it now, we’re probably able to spot it if we hear it read or recited by someone else. At least I hope so. The Declaration of Independence is more than a long-ago proclamation of separation from Great Britain, it’s a legacy, left for us by the Founding Fathers of our country and it bears an important message for Americans today, and tomorrow. It would be good for us to revisit the entire declaration, but there are three lines in particular that I think worthy of pondering this Fourth of July because they remind us of the principles upon which the United States was founded and that we should live by today, not only in our country, but also in every aspect of our lives: human dignity, justice, and trust in God. The first is found right at the beginning of the document. The fact of the matter is that we’re all children of God, made in his image and filled with his grace. Because of that, we’re worthy of respect, deserving of freedom, and entitled to live a life of faith in honor of the Creator who made us. We can never forget our worth nor how much God loves us. The second ponderable line is buried in the middle of the text. It’s present-day value is easily missed if one thinks of the Declaration only in terms of the Great Britain-New World Colony context. Jesus himself made it clear that no one should be subject to tyranny. The original statement doesn’t apply just to King George, but to anyone who imposes tyranny on others. Tyranny comes in many forms – child abuse, spouse abuse, employee mistreatment, racism, and all the way to political leaders who misuse their power. The tyrant doesn’t necessarily hold an office, he could be your boss, your neighbor, or even you. It’s anyone who improperly exercises authority and exploits others. Such persons are unfit for the position they’re in, and as free children of God, we’re obligated not only to refute their tyranny, but to do what we can to stop them. Our forefathers sought justice – authentic, Godly justice – for themselves and their fellow colonists, and we should be seeking for ourselves and our fellow countrymen today. The Declaration of Independence concludes with a powerful statement that puts trust where it belongs – in God, and not in men. Notice that the declaration’s authors specifically mention firmly relying on divine Providence. They heeded Jesus’ words and put their trust in God. “Do not worry then, saying, ‘What will we eat?’ or ‘What will we drink?’ or ‘What will we wear for clothing?’ For the Gentiles eagerly seek all these things; for your heavenly Father knows that you need all these things. But seek first His kingdom and His righteousness, and all these things will be added to you,” Jesus said to his disciples. In putting together the document that would lead them to dignity, freedom, and justice, they pointed not to themselves or other men, but to God. That’s where our country started, and that’s where it should be today. Then they pledge themselves to each other, not as empowered individuals, but as brothers bound by their shared inheritance as children of God. There’s much to unpack in these three lines from the Declaration of Independence. Perhaps we can try to unpack them a bit more ourselves as we’re unpacking our coolers and tote bags this Fourth of July. When the fireworks do go off, perhaps their brilliant light can remind us of the Light of Christ within us and our dignity as children of God and United States citizens.